In medieval times, the wearing of head ornaments was quite common. Royalty wore coronets and rings of leaves, plants and flowers and the dowries of wealthy brides included a jeweled coronal or garland as part of their wedding attire. Headpieces remained popular until the sixteenth century when the plume or tuft of feathers, attire and billiment (an ornamental band that formed the border on a Medieval head-dress, or cornet to which the hood was attached)rose to fashion. One of the few remaining artifacts from this time period is the Iron Crown of Lombardy which has become the symbol of medieval Italy. It was made in the Early Middle Ages,(8th or 9th century) and consisted of a circlet of gold fitted around a central iron band, which according to legend was beaten out of a nail of in which Jesus was crucified. The nail was beaten into a 1-centimeter thin band. Around this band was built a gold crown. It has six sections and is the size of a large arm ring. Historical documents suggest that it used to be larger, but a couple sections were lost and the remainder were re-positioned into the current smaller circle. Etruscan art was the form of figurative art produced by the Etruscan civilization in central Italy between the 9th and 2nd centuries BC. The origins of the Etruscans, dates back to the people who inhabited or were expelled from Asia Minor during the Bronze Age and Iron Age . Ancient cultures influenced Etruscan art, such as Greece, Phoenicia, Egypt, Assyria and the Middle East. Katherine Schwab, a professor of art history at Fairfield University who has long studied Greek culture, recently took a closer look at the hairstyles that top the Caryatids (or maidens) statues that serve as columns for the Athenian Acropolis. In 2009, she teamed with stylist Milexy Torres and six students, to recreate the looks. Each style took about an hour to complete, according to a recent news release. Some New York City stylists have announced that the fishtail braid is the elegant braid this year. From my art historical and archaeological perspective this is fascinating because the history of the fishtail braid reaches back into ancient Greek art and culture. Ancient Greek hairstyles were often deeply connected to the identity of the wearer to indicate a stage of life – child, adolescent, married, etcetera – particularly for females. The Caryatids seem to represent maidens who will soon be married. 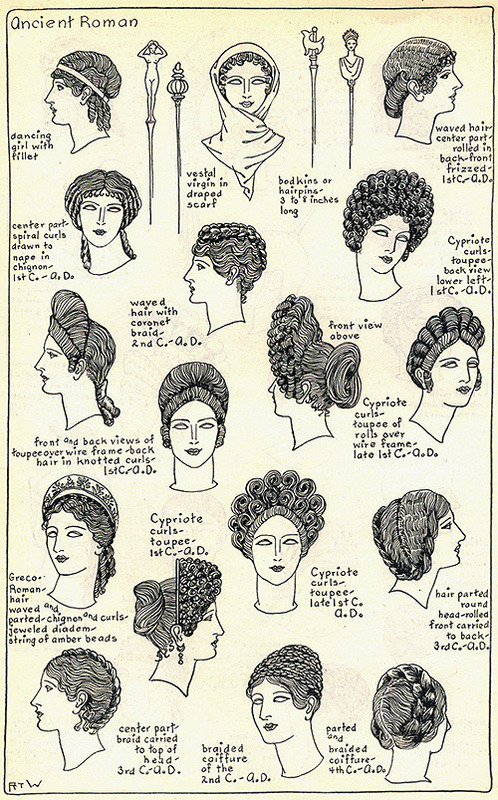 In a Huffington Post article "How To Wear Your Hair Like The Ancient Romans Did"
Janet Stephens, a hairdresser based in Baltimore, took a trip to the Walters Art Museum back in 2001 and learned about the intricate hairdos worn by Vestal Virgins so she could duplicate them herself. But she ended up delving further into the fashion and art history books than she'd anticipated. Four years later, Stephens made a phenomenal discovery that she says "essentially changed the field of classical hair studies." While reading Roman literature, she stumbled across the term "acus" which has been translated to "hairpin." 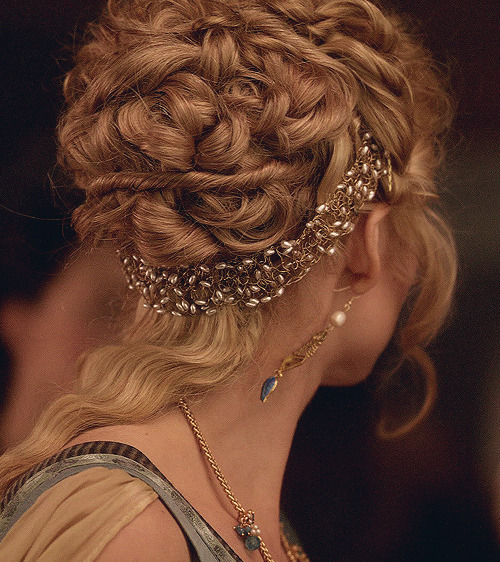 But Stephens' experience with embroidery sparked the theory that these ancient hairdos were actually created using a needle and thread -- which was pretty convincing. Her findings were published in the 2008 edition of the Journal of Roman Archaeology. Catherine Deane Beaded One-Shoulder Tulle Gown. This signature Catherine Deane gown features a beaded bodice on a Romanesque silhouette.Finish the look with metallic gladiator sandals. Tulle. Ruched, beaded bodice with layered detail. One-shoulder. A Hellenistic gold oak wreath, Circa 4th-3rd Century B.C.